Using oak barrels when creating a wine is somewhat like cooking your favorite dish. Should you use a subtle amount of dried herb, or a giant handful of herbs fresh from the garden? The answer: it depends on what dish you are creating and how you like it prepared. Is it a dish a recipe your mother, grandmother and great grandmother have handed down through the generations or is this a new dish with modern flavors? Is this a dish with delicate hints of subtle flavors, or a bold dish bursting with bright tastes? In the winemaking world, we primarily use French or American Oak, although there are many other ways to add oak. French Oak is what most think of when they think of premium wines. It tends to add flavor compounds in a more subtle way than the other main types of oak. Pinot Noir and Chardonnay are an ideal match for French Oak because they “soak up” flavor more easily than other varieties (such as Cabernet Sauvignon). Using American oak might overwhelm the subdued characteristics of the grapes. American Oak imparts stronger sweeter flavors often described by wine experts as dill, coconut, and vanilla. It adds ruggedness to clean, fruit-forward New World wines, for sure. Bolder flavors for riper grapes. Examples of American wine producers who’ve championed the use of American Oak include Silver Oak and 5 Star Cellars. American White Oak grain sizes tend to have looser and larger grains than both French and Eastern European Oak, which means American oak barrels tend to impart more flavor. Hungarian and Eastern European Oak is the same type of oak tree as French Oak (Quercus robur). More and more Eastern European Oak barrels are being used at wineries for oaking wine, as it is remarkably similar to French Oak, but costs much less. It is primarily used with full-bodied varieties, such as Malbec and Petite Verdot. European Oak is commonly considered the midway point between American and French Oak, both in terms of cost and aroma imparted. A single, mature oak tree will only make enough wood for about 2 barrels, which will hold only 50 cases of wine. (For reference, the famed Silver Oak produces about 1600 cases a year) As demand for wine worldwide increases, oak forests are being strained. Using new oak barrels for every vintage is expensive and wasteful, so the winemaking world is seeking out more environmentally friendly strategies. Surface area is what counts when it comes to flavor. 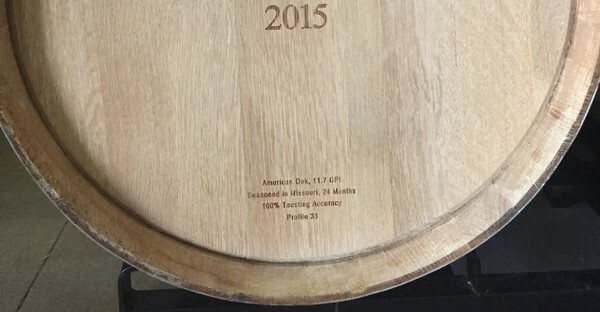 Many of the aroma compounds in new oak barrels are wasted on unused surfaces, i.e. the outside of the barrel. Oak staves, oak chips, and oak cubes are smaller and can use all sides to add aromas to wine.